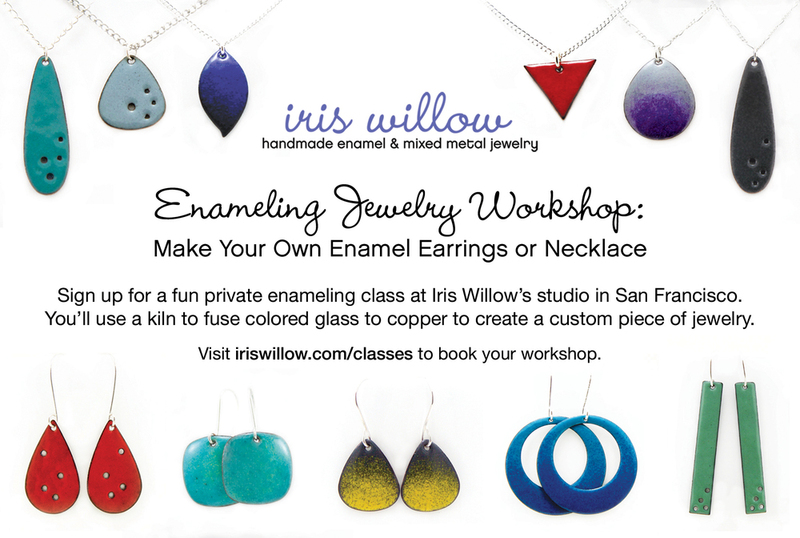 I'm super excited to announce that I am now offering private enameling jewelry classes out of my studio in the Mission district in San Francisco, CA. You select the day and time that works best for you to schedule a private one-on one class or group class with up to three of your friends. Make a custom piece of jewelry for yourself or a custom present for that jewelry lover on your holiday list. You'll use a kiln to fuse colored glass to copper to create a custom pair of earrings or necklace. I will show you each of the steps and then you'll have a chance to try it out for yourself. You select the shape, colors and design in this entirely hands-on class. Visit my classes page to learn more and book your class today. I also have gift certificates for my private classes available, which make great gifts for crafty folks on your holiday list who'd be interested in making their own jewelry.